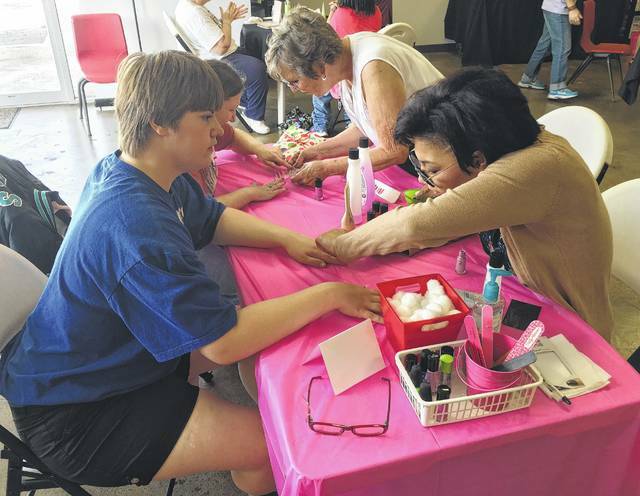 BUCYRUS — Women from Waycraft Industries, which is operated by the Crawford County Board of Developmental Disabilities, recently participated in a Diva Day, which gave them a chance to receive a makeover courtesy of independent beauty consultants. Activities included getting face makeup applied, fingernails worked on, new hairstyles and others. Waycraft Plant Manager Mark Beran said Diva Day is a great way to get the women involved in the community. Even more than the beauty skills, Beran said the outing helped the women with things such as communication and people skills. Beran said he considered the first Diva Day a success and hopes to continue it as a form of day-hab for the workshop employees. Day-hab is an opportunity to get workshop employees out into the community. Consultants said they enjoyed providing a service that many of the women do not typically partake in. Beran said he hopes Diva Day continues and he hopes more opportunities are provided, including men-only events and some co-ed activities. He said he hopes members of the public will take the time to get to know the Waycraft employees and try to better understand the abilities they possess and positives they bring to the community.